Lake Erie commerce has played a central role in the development of Huron. Important among Huron’s maritime industries were shipbuilding and commercial fishing. The city’s shipbuilding industry dates to the first decades of the nineteenth century. Shipyards were located on the Huron River’s west bank, slightly north of this marker, and also upstream at Fries Landing. Among the vessels built at Huron were the Great Western, constructed in 1838 and the first lake ship to have above-deck cabins; and the Golden Age, which, at 286 feet, was the largest craft on the Great Lakes when built in 1886. Huron shipbuilding declined as the nineteenth century drew to a close. Commercial fishing emerged thereafter, serving as Huron’s economic cornerstone for over fifty years. Huron’s fishing enterprises included the Huron, Kishman, Scott, and Zimmerman fish companies. By 1950, however, polluted lake waters ravished the once-lucrative industry. Although shipbuilding and commercial fishing are no longer a part of Huron’s daily life, they each had a profound effect upon the community’s growth for nearly two centuries. Text : Side B Huron’s lighthouses have served as beacons for Great Lakes shipping since the early nineteenth century. 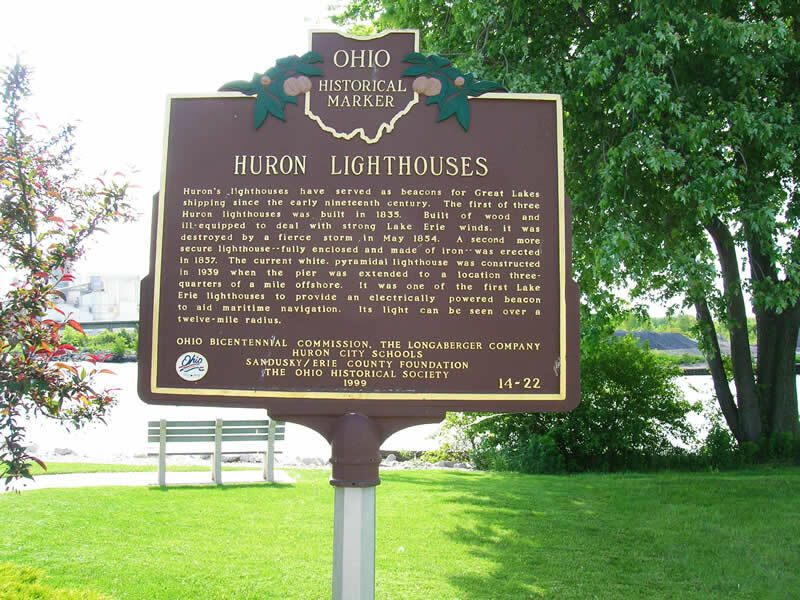 The first of three Huron lighthouses was built in 1835. Built of wood and ill-equipped to deal with strong Lake Erie winds, it was destroyed by a fierce storm in May 1854. A second, more secure lighthouse — fully enclosed and made of iron — was erected in 1857. The current white, pyramidal lighthouse was constructed in 1939 when the pier was extended to a location three-quarters of a mile offshore. It was one of the first Lake Erie lighthouses to provide an electrically powered beacon to aid maritime navigation. Its light can be seen over a twelve-mile radius.